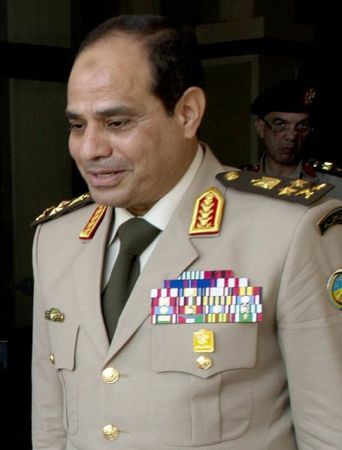 WASHINGTON, Feb 4 2014 (IPS) - Abdul Fattah al-Sisi is set to run for president and is expected to win handily. The ruling junta and the interim government have taken several steps to make this happen. Interim President Adly Mansour recently promoted Sisi to Field Marshal, the highest rank in the Egyptian military, despite his lack of military combat. Egypt’s Supreme Council of the Armed Forces (SCAF) followed Mansour’s action by giving the newly minted Field Marshal a “mandate” to run for president in response to the “desire of the masses.” Sisi’s response: It was his “duty” and an “obligation” to do so. The Field Marshal is hoping the Egyptian “Street,” which rejected Nasser’s resignation after the disastrous defeat of the 1967 war, would crown him as another modern-day Pharaoh of Egypt. To guarantee his victory at the polls and to shield him from parliamentary oversight, Mansour altered the so-called road map to allow for the presidential election to precede the parliamentary poll. Not to be outdone, Interim Prime Minister Biblawi announced a reshuffle of his cabinet, including the ministry of defence currently headed by Field Marshal Sisi. Sisi’s high stakes political game comes barely 18 months after former President Morsi appointed him minister of defence and despite his previous statements that the military should shun politics and return to the barracks. While he was publicly declaring allegiance to Morsi and civilian control, he proceeded to conspire against the freely elected leadership and torpedo civilian rule. Once Sisi “retires” from the military and the cabinet, he would be free to seek the presidency as a “civilian” person. He would then present himself to the Egyptian masses as the “Savior” and “Indispensable Man”—much like other military-turned-civilian dictators who preceded him. He seems to forget that shedding the military uniform and donning a business suit just doesn’t cut it anymore. The era of military dictatorships has passed. The recent announcement by the two potential challengers Abdul Min’im Abu al-Futuh and Hamadayn Sabahi that they would not run for the presidency is seen to bolster Sisi’s presidential ambitions. Sisi wants to resurrect the tradition of strongman rule despite its rejection by the January 25 Revolution. According to media reports, Sisi looks to former President Gamal Abdul Nasser as a role model and would like to emulate his rule. But he is too young to remember the period when Nasser’s wars cemented his cult personality. Sisi was two years old when the Suez war occurred, seven at the start of the Yemen war, 13 during the 1967 war, and only 19 at the time of the 1973 October War. He graduated from the military academy in 1977 and pursued his political/military career in the halls of power, especially through Military Intelligence. He is reputed to see previous leaders, including Sadat, in his recurring “visions” while asleep. These visions, some media reports speculate, have led him to believe he is destined to lead Egypt and to recapture its glorious past. This task requires a cult personality, which he and Egypt’s pliant state media have been feverishly nurturing. The Field Marshal is hoping the Egyptian “Street,” which rejected Nasser’s resignation after the disastrous defeat of the 1967 war, would crown him as another modern-day Pharaoh of Egypt. Jihan El-Tahri, an Egyptian born world-renowned movie producer, has titled her forthcoming film on Nasser, Sadat, and Mubarak “Egypt’s Modern Pharaohs.” Sisi seems to be following in their footsteps. The high stakes political game is set to begin in Egypt with Sisi’s expected announcement confirming his intention to run for president. Popular hysteria will carry him forward, but Sisi must realise this kind of mass adulation is short-lived and could turn against him fairly quickly. Politically active and aware Egyptians will soon realise that Sisi’s presidency would result in three disastrous realities for Egypt: first, a return to military dictatorship; second, an emasculation of the January 25 Revolution; and third, a re-institution of the economically powerful plutocracy. As Sisi’s presidency begins, Egypt will be suffering from high unemployment, a tanking economy, an anemic tourism industry, low foreign currency reserves, a poor human rights record, growing communal violence and even terrorism, but above all high popular expectations. The January 25 Revolution empowered Egyptian youth to search for dignity, freedom, social justice, and employment. Like Morsi before him, Sisi will not be able to turn the country around, especially as human rights of secularists and Islamists are violated and illegal arrests, sham trials, and harsh sentences continue unabated. Sisi’s presidency is dangerous for Egypt and harmful to U,S, interests and security in the region. Sisi’s Egypt and the U.S.
A Sisi presidency, should it come to pass, will have to address the endemic economic and severe human rights problems facing Egypt. If Sisi fails to do so in his first year in office and continues massive, indiscriminate human rights violations, it would not be unthinkable for Egyptians to hit the streets demanding his resignation. If that happens, he could find himself on trial next to his two predecessors in the same soundproof glass cage. Emile Nakhleh is a former Senior U.S. Intelligence Service Officer, a Research Professor at the University of New Mexico and author of “A Necessary Engagement: Reinventing America’s Relations with the Muslim World”. The Egyptian will vote for President not magician.Let the people decide and once have a President they should all start building their nations by working and not by protesting.Those criticizing just shut up coz nothing will happen if other people will only wait to find fault on others.Their constitution is much better now so Good luck!